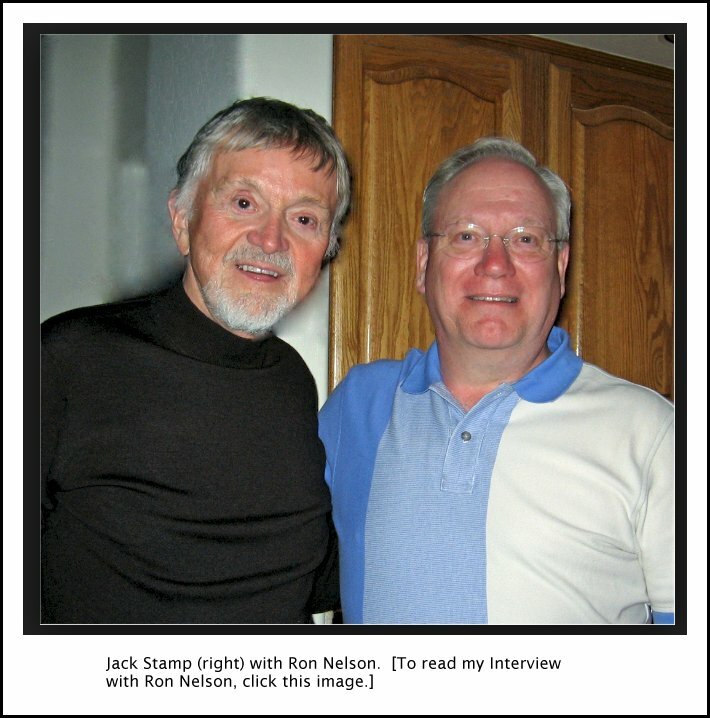 Jack Stamp Interview with Bruce Duffie . . . . . . . . Prior to his appointment at IUP, he served as chairman of the Division of Fine Arts at Campbell University in North Carolina. He also taught for several years at John T. Hoggard located in Wilmington, North Carolina. In addition to these posts, Dr. 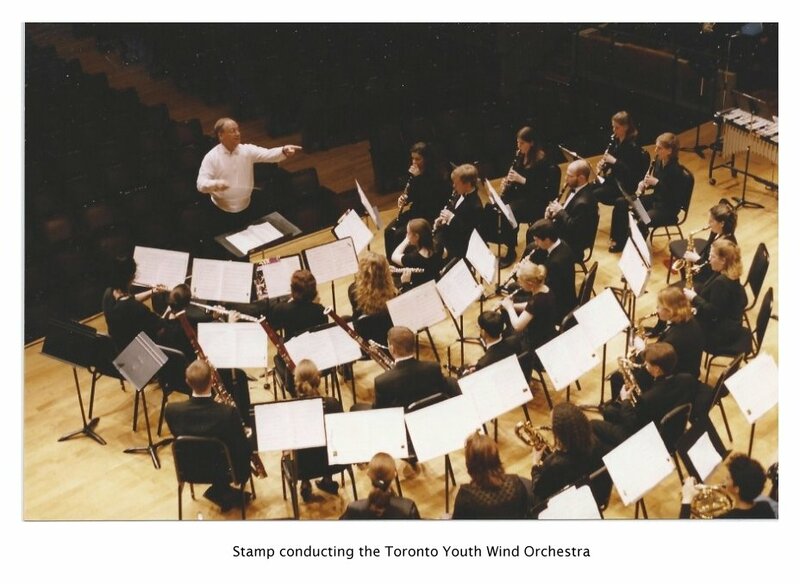 Stamp served as conductor of the Duke University Wind Symphony (1988-89) and was musical director of the Triangle British Brass Band, leading them to a national brass band championship in 1989. Stamp's primary composition teachers have been Robert Washburn and Fisher Tull, though he was strongly influenced by his music theory teachers at Indiana University of Pennsylvania and East Carolina. Other studies include work with noted American composers David Diamond, Joan Tower and Richard Danielpour. 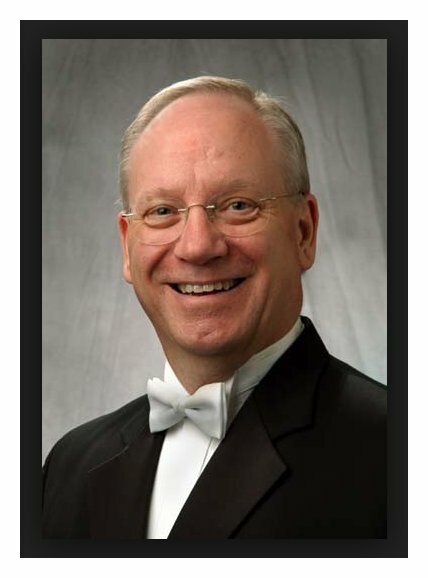 He is active as a guest conductor, clinician, adjudicator, and composer throughout North America and Great Britain. His compositions have been commissioned and performed by leading military and university bands across the United States. In 1996, he received the Orpheus Award from the Zeta Tau Chapter of Phi Mu Alpha for service to music and was named a "Distinguished Alumnus" of Indiana University of Pennsylvania. 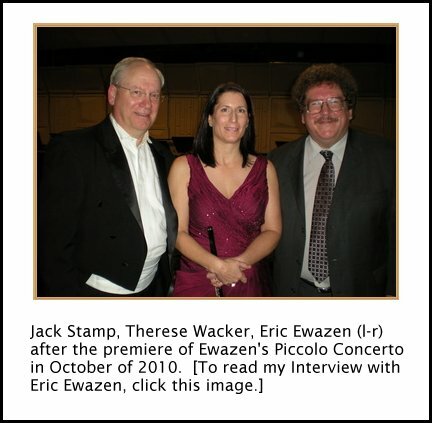 In 1999, he received the "Citation of Excellence" from the Pennsylvania Music Educators Association. In 2000, he was inducted into the prestigious American Bandmasters Association. He was awarded the title of "University Professor" for the 2008-2009 academic year at IUP, the highest award the university gives to a professor. Born in March of 1954, it was in March of 1994 that Jack Stamp was in Chicago. A new piece, written for the 1994 Honors Band was being conducted by Colonel Arnald Gabriel, and both artists made time for (separate) interviews with me. This webpage presents the conversation with Stamp. 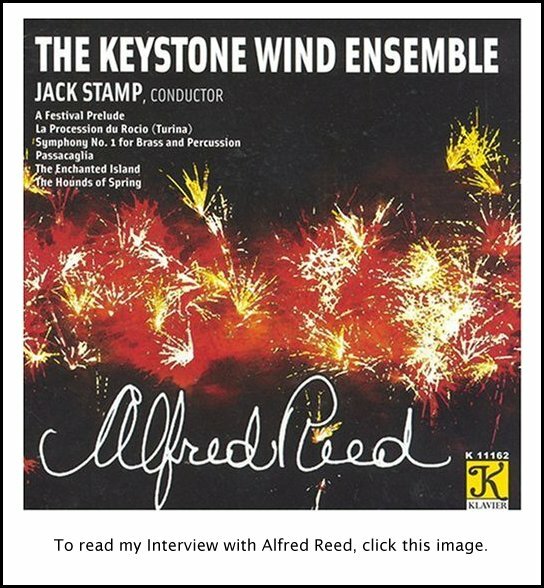 Preparing this transcript of an interview from twenty years ago, it is comforting to know that both the conducting and composing artistry of Jack Stamp have continued very well. 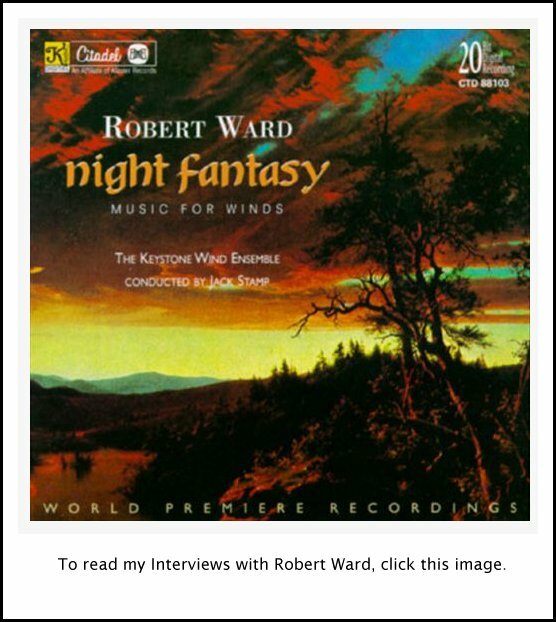 Besides all of his performances and clinic appearances, he now has a number of pieces recorded by his own Keystone Winds, as well as several other ensembles on various labels. Many of my interview guests over the years have been multi-taskers, so that is where we began talking . . . . .
Bruce Duffie: You are both a composer and teacher? Jack Stamp: Yes, and a conductor. My main job is conducting. BD: How do you divide your time amongst those taxing activities? BD: It’s transcribing the piece! JS: Right. You already know what you’re going to do, and it just takes time to actually orchestrate it. But it’s not a lot of creative energy that has to go into it at that point. BD: How much of the music you write is for band, how much for orchestra, and how much for ensembles? JS: That’s a good question. In fact, the majority of my music’s been for band. Initially it started because that’s such an instant medium to get your music played. If you write a band piece, people will play it. If you write an orchestra piece, you don’t know. Maybe a brass quintet you can get around, but a band piece has instant acceptability — if the people like the piece. There’s such a network of band directors that the piece will get lots of hearings. And if you have one successful band piece, then the commissions start to be band commissions. That’s kind of what has happened to me. Though I’ve written some other pieces, the majority of my work in the last seven years has been for band. In fact, a year from now I’m taking two years off and I am not going to write another band piece. I’m going to try to write a piece for chamber orchestra, a string quartet and some other pieces to cleanse the palate. BD: With the idea that you’ll come back to writing for band? JS: Oh, absolutely! There’s a little bit of wanting to stay in the band field because I’ve had successes in that. In fact, in the last couple years I’ve written several pieces for band, and if they’re published these pieces will come out periodically. So it won’t look like I’ve stopped composing for band, because they’ve been stockpiled with publishers. So while I’m not actually writing for band, I can expand my horizons a little bit. BD: Are you purposely holding these back so they do come out piecemeal? JS: No, the publisher actually does that. They used to publish two and three and four pieces by one composer a season, but now they do it seasonally. It’s based on the Midwest Convention that’s held here in Chicago every December. The pieces are coming out at that time, so they’re advertised and there’s this one big blitz of publication for school bands at that time. Now the publisher only wants to bring out usually one piece a year, and see how that works. I guess it’s kind of like the carrot out there. The publisher right now has four of my pieces, but they may bring two out in the fall because one’s a very short fanfare. The other was just played today by a group from Colorado. BD: You get commissions from the various bands. How do you decide whether you’ll accept them or turn them aside? JS: Pretty much if I’m not scheduled, or if the group can wait until I can fit them in, then that’s usually how I decide. I usually don’t base it on who it is. Some composers who are a lot more well-known than myself, can pick and choose their commissions. I really don’t do that. I say, “I’m booked up until the spring of ’95. Can you wait ‘til then?” They have to decide. That’s why I’ve said now I’m going to stop it for the spring of ’95, so if anybody calls me, I can say, “Well, no; in the summer of ’97 I could start your band piece.” So I set those deadlines for myself, but pretty much it has to do with their willingness and their ability to wait for a piece, or my ability to write it at a certain time. BD: The orchestral works that you’re going to be doing in the mean time — have these been commissioned or are these just things you have to write? JS: That’s interesting you should ask. They’re going to be things I just want to write, which is kind of fun. I have a friend that conducts a chamber orchestra outside of Milwaukee, in Waukesha, Wisconsin, and I think I’m going to write a piece for him because I know it would get one performance. Then there are some of the faculty at my university. I’m thinking about writing a piece for brass quintet and percussion, a combination of almost a percussion ensemble with brass quintet. And I’d like to write a few more songs. I’ve written some songs, and I’d like to write a few more of those. BD: Is it easier to write for a specific ensemble, rather than just a band or an orchestra? JS: I don’t know. Both are challenges, and I like both challenges. I like parameters in my writing, and I like no parameters. This fall I wrote a piece for Louisiana State University. It’s a 15-minute divertimento, and I could pretty much write anything I wanted because I knew they could play it. That freedom is nice. But then when you write for, let’s say, a high school band from a small town in Michigan — which I wrote this Elegy and Affirmation for that was played today — I ask them who their strong players are. They said, “We have a good trumpet player this year; we have a good trombonist this year; we have a good saxophonist, but we only have two trombones and we don’t have any oboes.” Those parameters don’t bother me. There’s a challenge to me, and I try to fit the piece to the band. Occasionally you’ll double-score or cross cue a part. For instance, they don’t have an oboe, but you’d like there to be an oboe solo. So you say in the score, “If oboe available, make it an oboe solo,” so that the piece is more accessible if it gets published. BD: Otherwise it goes to the back to the cornet? JS: Right, right, muted cornet. But I don’t mind the parameters that a commissioning part would put on me, if they say, “It can only be this hard,” or, “We only have this instrumentation.” That doesn’t bother me. In fact, that’s a challenge, too, just as the freedom of writing for anybody is. BD: Speaking of freedom, how much freedom do you allow the conductor to experiment, to expand and contract your music? JS: The great composer Vincent Persichetti — who was also a great teacher and taught at Juilliard for 40 years — said that sometimes conductors are too faithful to the markings on the score. They’re afraid of offending the composer by putting their own personalities in the work. [See my Interview with Vincent Persichetti.] In my works, though I’m kind of strict about tempi in certain places, I’m not real strict with the expressive markings. I like to see interpretations. For instance, I don’t know how this piece that they’re going to play tomorrow is really going to sound. I know what it sounds like, sure, but filtered through Colonel Gabriel, it’s going to take on a whole new picture, and it might be exactly how the piece should sound. Because the piece hasn’t been born yet, you could say that Colonel Gabriel’s kind of a midwife in the process. He’s going to bring the piece to life. I’ve written it, but he puts his signature on it with his personality. If it’s too far off of what I think it should be, I’ll say something. But I like the freedom. I have some friends that like certain pieces that I’ve written, and they actually conduct those pieces better than I do because maybe I have too much of an analytical attachment to them. I know how everything goes, and they have more of an emotional attachment because they learned the piece through conducting it and just liking the piece. BD: You say that Colonel Gabriel is going to give birth to this piece. Does each conductor who then conducts this piece from now until eternity give rebirth to it? JS: I think they do. Some conductors fall in the trap, though, of listening to a recording of a piece and then trying to emulate the recording. It’s my hope that conductors will put their personality into the piece — as long as they don’t distort my original intentions. I don’t want them to mimic me. I want to see the piece as a reflection on them. BD: How far is too far? BD: Is your score basically clean, or do you litter it with lots of directions? BD: Then you do also give specific tempo markings? JS: Oh, absolutely. In this piece a quarter note equals a certain thing. Now, if it’s a bit to one side or other, I don’t mind that. I’ve had pieces where there have been sometimes 32 metronomic markings different. JS: That’s not poetic license, that’s a little bit of distortion. However, if it says 76 and they want to go 80, or they want to go 70 and the proportions are right as to what comes next, that doesn’t bother me. A perfect example of this is a piece I wrote called Divertimento. The third movement is dedicated to Joan Tower, who is a wonderful composer. [See my Interview with Joan Tower. Note: Each movement is dedicated to various people — Fisher Tull; In Memorium William Schuman; Joan Tower; Mike, Gary, Bud, and David; David Diamond. See my Interview with William Schuman, and my Interview with David Diamond.] I got to take some lessons with Tower this summer. The movement is called Fury, and it’s a very angry piece. I wrote it on a computer so the printout looks very much like it’s published. That’s mainly the reason I do it, because usually I’ve written for student groups, and I’ve found that they read printed parts that look like they’re published better than manuscript parts, even if the manuscript’s very clean. Part of it’s psychological. JS: Absolutely, absolutely. So I write at the computer. Also the computer with a MIDI card can play back this music. So this Fury is furious and it’s very fast, and the computer just nailed it. When Louisiana State tried to do it, it was physically impossible to really make it work on the instruments. The computer could do it. You push a button and there’s no problem. I realized that the tempos were all wrong because it didn’t fit the group. Technically the computer should be able to play it. It’s like a suit. When they tried on the suit, it didn’t fit because I didn’t have the right measurements. BD: But the tempos weren’t wrong because you liked it when the computer played it properly! BD: So which is right, then — the band that plays at a little different tempo, or the computer that plays it the way you wanted it? JS: Right, and there’s the rub. Obviously, if I want it played right, we had to back the tempo down a little bit. But we didn’t change the proportions, so the relationships of tempos all where the same, and then the same feeling was gotten from the music. The energy level that the computer could play at is all one sound, versus when you have actual live musicians playing it, they can create a whole other sense of energy, which made up for the change in tempo. BD: Do you then put a note in the score that when it’s possible to play it at the original tempo, they should do it? JS: No, I didn’t. Actually I backed all the tempos because when piece was played again the same problem happened. So it’s my fault. BD: But fifty years from now, someone’s going to listen to this tape [or read this transcription], find that piece, and decide it should be played at a different tempo. BD: So this is my question — which do you want? Do you want the practical way that it was done now, on ‘original’ instruments, or do you want it done their way later on, on then-modern instruments? JS: I don’t even think about that. That doesn’t concern me. I want people to enjoy the music, and they weren’t enjoying it at what I had written. I realized I hadn’t written something that was feasible. I guess they could play it, but the piece didn’t sound. The tempo restricted some of the resonant quality and the energy and the volume of the piece. Because they were having to play so fast that it affected other parameters of the music — the sound, the timbre, the volume, and just the sheer energy. So by backing back the tempo, all those qualities came through the music. I don’t say I’m sacrificing tempo, but technically I could sacrifice tempo so that these other elements would rise to the top. So sure, if a band could play it faster, that would be nice. But these are great, great players, and I’m not sure it can be played at the volume and energy level I want at that tempo. BD: Pursuing it just a little bit — and then I promise we’ll get off of it — would you perhaps want to make this a purely plastic performance, only on a record made by the computer, so that it sounds the way you imagined it? JS: Because I think it’s artificial. What the computer does for me is let me know what I’ve done harmonically, and if my counterpoint works because the counterpoint I write is far advanced from my keyboard skills. That’s what I use the computer for. BD: But it sounded the way you wanted it there, and had the furiousness. JS: It had the rhythm sound the way I wanted, sure, and the tempo sound the way I wanted. But when I heard it with the real instruments that were supposed to play it, that was what I envisioned, not the computer. It wasn’t written for computer; it was written for band. I realized it didn’t work with computer. So I guess if somebody said, “We’d like to do a computer arrangement of your band piece,” then I’d say, “Well, fine. Then kick up the tempo.” But if you’re going to do it with the instrumentation that it was intended for, it probably works better at this tempo. BD: Would you be happy if another computer program could play it at the right tempo and put in all the colors and textures that you want? JS: No, because that’s not live musicians. There’s no feeling in that. There’s just technical computer chips that are going to make it right. I’m not Edgard Varèse, who said, “I don’t want people to play my music if a computer can do it, because it can play exactly what I want.” I haven’t gotten to that point. BD: Do you think you’ll ever get to that point? JS: I’ll never get to that because the problem with the computer is that it’ll play it the same way every time. That’s not what we’re looking for in music. There’s no feeling in doing it the same way every time. If you feel a piece differently and you experience the piece, you’re going to have a different response to it. Or a different group’s going to have a different response to it than another group, so the performance is going to be different. That’s the beauty of live music. Why do we have umpteen recordings of Beethoven’s Fifth Symphony? Because they’re all different interpretations and different experiences. BD: So none is right, and all are right? BD: Okay. We’re hitting it from a funny angle, but let me ask you the big question. What is the purpose of music? JS: I think ultimately music reflects life, and some of what I try to do with music is not necessarily to be programmatic with that. I’ve always had a problem with band music — at least as it’s been composed for schools — in that it always reflects a major chord. It always respects all the beauty, or everything is nice and wonderful, and life is not like that. If you ever listen to some of the school pieces that have been written for band, they don’t delve into anything that’s very technical. It’s very superficial music, and the students aren’t experiencing the power of music when it is written at such a superficial level. A perfect example that has been played here in Chicago recently is the Corigliano Symphony Number One, which is a powerful piece. 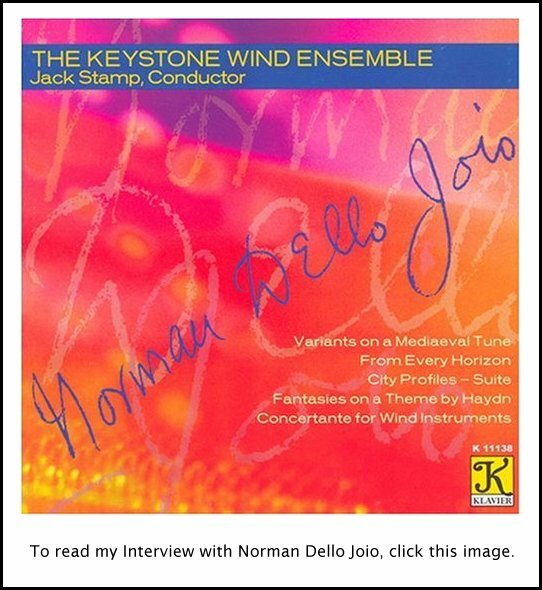 [See my Interviews with John Corigliano.] Recently I was working with a regional band in Pennsylvania, and I said to the students, “You’ve got to realize that music is more than just pretty chords all the time. Music is supposed to reflect life.” I played for them the tarantella movement of that symphony on a boom box I held in my hand on the podium, and you should have seen the horror on these kids’ faces when they heard that movement. I told them that the piece was dedicated in memory of AIDS victims. I had kids coming up to me and saying, “How do I get that CD?” They had never played a piece like that before, but because it had been presented to them in a particular way, their whole world opened up. I think that’s what music is supposed to do. It’s supposed to open up some of these worlds to musicians, student musicians, and to audiences that may not be opened up. Why is this piece so popular? It was on Billboard charts because it spoke to people. BD: Do you try to write this into your music — something that will speak to the young children? JS: I do. I try to write music that doesn’t sound like anybody else’s. It’s programmatic, but I don’t think my music is derivative. In the beginning, sure, my music sounded like my teachers. It sounded a little bit like William Schuman. It sounded like all these influences from music I had listened to. But I think my music now sounds like my music. You were talking about the commissions for band, and what catapulted me into having people really being interested in my music for band was a piece called Gavorkna Fanfare. I wrote that for the Cincinnati Conservatory as a gift to Eugene Corporon, who is one of the clinicians here this weekend. People heard that, and it didn’t sound like anything else they had ever heard. They had never heard a fanfare for full band. A fanfare is usually brass and percussion. So it was a fanfare for full band, and it used some minimalistic techniques, but was not overly minimalistic. It had a fugue in it, and there are lots of other little things in it. It was very individualized. I was trying to was write a fanfare that didn’t sound like the great Copland Fanfare. It sounded different, but yet it’s very accessible. I think you do write for an audience. I’m not a person that believes that you don’t write with an audience in mind, or players in mind. But you also have an obligation to educate your audience and your players with your music, not just give them some sort of pabulum or pacifier. BD: Coming back to the idea of the Corigliano work, would that stimulate you to get the rights to make an arrangement for band of it? JS: I don’t think I’d do it. I’m a real purist with that, and of course I’d have to ask Corigliano. But I don’t think that piece would work with winds. I think about all the string harmonics that are in it that you probably couldn’t replicate in the wind writing. Actually a composer at University of Texas who has suffered from the HIV virus has written a symphony for band based on that. But personally I don’t enjoy some of the recent orchestral works that have been transcribed for band. We’re not talking about Romantic pieces. If the composer walked in, would he go, “Oh, man! What a great version of my symphony!” or would he or she say, “That’s awful! Why did you do that? This is supposed to be for orchestra!” So I’d rather John Corigliano write a piece of the same magnitude and the same power for winds, because I know he could do it, and it would be great. BD: So if the Romantic composer could mystically walk in, you don’t feel that he would be pleased to have this band bridge the gap, and get students to then want to explore the original version? JS: I think you have to draw a fine line between what idiomatically works for your instruments. So if you’re playing violin parts on clarinets, that that may not work idiomatically for a Beethoven symphony or a Tchaikowsky symphony. You have to weigh the two options. There are pieces by both composers that work as educational pieces and work in the medium. But to play it so you can have an opportunity to play Beethoven’s Fifth may not be the best reason. Maybe study Beethoven in a session, talk about his symphonies, and find the best piece that’s transcribed for band to teach the music of Beethoven. Anyway we have wind pieces by Beethoven. We have the Octet and the Rondino, and we have wind pieces by Strauss. We also have wind pieces by Mozart, the Three Serenades, which are wonderful. So with those pieces you can experience some of these composers in their original medium. BD: When you’re writing a piece, be it for band or orchestra or any other combination, I assume you don’t compose only at the computer? JS: Actually, I sketch at the computer now. I didn’t used to, but I found that when sketching at the computer, I could save what I had. Also with the cut-and-paste feature, I can move things around a lot quicker than actually doing it by hand. But I’ll get ideas and I’ll sketch them on manuscript paper. BD: Somehow, the notes are getting from your mind to either the page or the keyboard or the printout or something. Are you always in control of where those notes go, or are there times when the notes are leading you? JS: I think I’m in control of them, but sometimes they take different shapes than they originally started out to be. Maybe that’s the idea that the music starts to have a life of its own. Once I’ve composed enough of it, it starts to tell you the direction it should go. It’s interesting. Sometimes I’ll begin writing a part and realize that’s not the beginning of the piece at all. This would work better in the middle of the piece, and I’ve got to compose backwards. There are some composers that say you shouldn’t do that. Joan Tower said to me, “Start at the beginning and work towards the end of the piece, because organically, you need to have that fusion.” I think she’s right, theoretically. BD: That works for her. JS: Right, but theoretically that’s right, because it’s hard to compose backwards and thread something that hasn’t been written yet to something you already wrote. But some composers can do that. In some pieces, I’ve written the end of the piece first, and had to really work backwards. BD: Then are you working to create what’s behind it, or are you just finding what’s already there? JS: What I do is try to develop the ideas. If it doesn’t happen, then I have to go to another idea and decide if that’s even going to fit in this piece. There have been some times when I’ve been composing a piece of music that I come up with an idea and I go, “This is a whole different piece, so I’ll save it and put it aside.” Or that becomes the piece and the stuff that I originally worked on gets set aside. I don’t know if many composers work like that, but I work like that. I get to some ideas — whether they be motivic, harmonic, or even rhythmic — and expand on those and try to compose a piece around them. A perfect example is the piece that’s going to be premiered tomorrow. I came up with just this simple opening chord. It’s just a B flat major 9 chord, but the way I built it is intervallically from top, inside out so you never hear it played like a jazz B flat 9 chord. That’s all I had, and I struggled with where I was going to go from there. Well, the piece did take a little bit of its own, and by shifting some of these notes these sustained chords became different chords that bleed into each other in this opening. I still didn’t have a tune; I just had the harmonic idea, but I knew I could keep coming back to this harmonic idea in different shapes, whether it be articulated or just in a block form. Then I was able to compose a very short fanfare-type theme around these chords. That’s how that piece developed, but for a long time, I was just struggling with this chord and what to do. BD: Are you a better composer because you are also a working conductor? JS: Yes, and because I’m a practicing musician. I still play. I’m a percussionist by trade, but I love to conduct. I teach and I also compose. Part of it is just your psyche. If I’m really tired of composing, it’s fun to get out in front of a group and conduct. Or if I’ve been conducting these honor bands, which they have at this time of year and they’re having here, if I’ve done three or four of those in a row, it’s real nice to get behind a marimba or a set of tympani and play. This is just to keep shifting your focus, but it’s not a shift out of music. It’s not like going fishing. Although I like sports and things like that, I can just shift my musical emphasis, and it’ll recharge my batteries. I think composing makes me a better conductor than conducting makes me a composer, because of the composition of the knowledge of the instruments, the transposition, the textures. As a conductor, when you look at a score you can read a score a lot better having been a composer, and having written that manuscript on a score page. BD: Do you then help to interpret music that’s not written by you differently because you are a composer yourself? JS: I think so, though it’s interesting... I hadn’t conducted this Divertimento that I composed for LSU until about three weeks ago. I went to Dayton, Ohio, because the band wanted to do it, and I told them I had to practice! I had to actually practice conducting it, because my brain knew it as a composition that I had written, and it’s a totally different thing to have to conduct it. Obviously there is the physical side of it, but it’s just a whole different approach than the composer would take. So that’s an interesting concept that I just realized because I couldn’t just walk up and conduct this piece. It’s hard enough that I had to actually practice it and mark the score like I had never seen it before, because it requires some of the same musical abilities, but also different musical abilities. 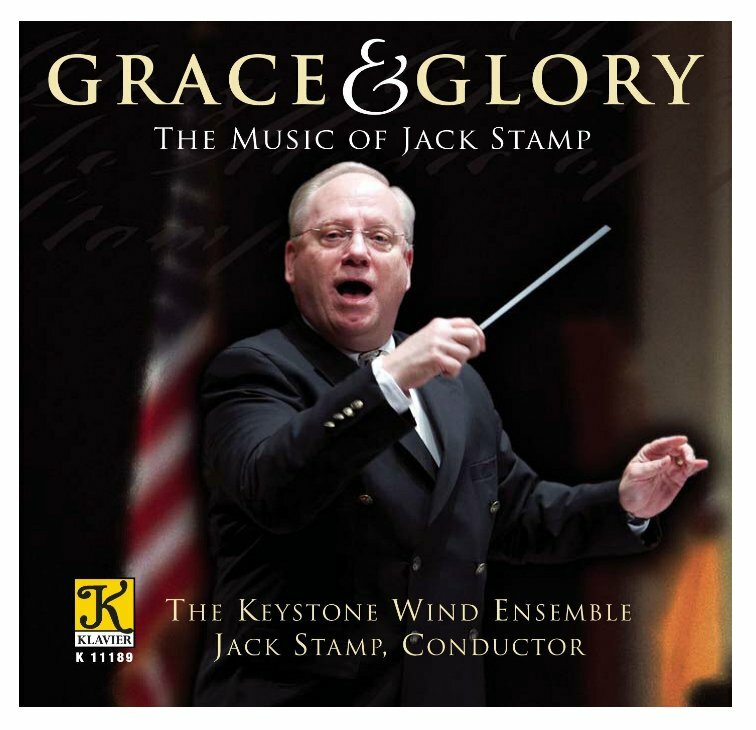 BD: Are there ever times when Jack Stamp, the conductor, screams at Jack Stamp, the composer? JS: Oh, absolutely! I screamed when I had that tempo wrong. I said to myself, “You idiot! It doesn’t work!” It took a band trying it on. Boulez said this at a wonderful workshop at Carnegie Hall last year. He said, “A piece is like a set of clothing. You try it on, and if it doesn’t fit you have to adjust it.” That doesn’t mean it’s not a good suit. It was a beautiful suit hanging on the rack, just like that was a beautiful section sitting on that piece of manuscript paper. But until it was tried on by whoever was going to perform it, he didn’t know if it would work. What if we had to do some alterations? BD: Then here’s the big question. Is it better to alter the suit, or wait until someone comes along who fits the suit? JS: I can’t say what’s better. For me personally, I say you alter the suit. I think it was Schoenberg who said he could wait. Someone had said there was a note that was unplayable on an instrument, and he said, “Well, eventually...” So he could wait. I say if you want it to be played, you realize it’s not an incompetence of the performer. It’s an expectation that though on the page it looks like it can be met, in reality it can’t be. So for me, if I want to hear the piece it’s my job to make the adjustment, and I do that willingly. BD: How long have you been directing bands? JS: I started teaching public schools in 1978, so since then. I was graduate assistant, so really ’76 is when I started conducting. BD: So that’s quite a bit of experience. Has the raw talent that you’ve seen gotten better? JS: I’m not sure it’s gotten better. We’re talking about the public schools and colleges, and the very best players are as good as they ever have been. I’m not sure the depth is quite what it was twenty years ago when I was in college. BD: In other words, there were more good players? JS: I think there were more players, but maybe the best are still as good, or better than they were. BD: Is this technically, or musically? JS: Both. I think part of it is just the experiences. With many of the cut-backs and the budget problems of public schools, sometimes the arts programs are the first to go and then you worry about the background of these students and what kind of background they’ve gotten. When you hear about Revelli and his high school band and the kind of training that those kids got, it’s a world of difference. [See my Interview with William Revelli.] There weren’t the problems back then that you have now. So I think part of it’s just the background that the students have when they get to a certain age and they decide to pursue music. They don’t have the depth of experiences that they may have had twenty years ago. BD: Are you optimistic about the future of music in America? JS: Well, I am. It’s interesting. Mr. Corporon is going to be at our school on Sunday and Monday doing a conducting workshop. I have these student interns that are going to conduct for him, and then we have a bunch of public school educators that are going to come in the next day and conduct. Seeing these kids work, they’re so much better at conducting than I was when I was their age. I tell them my job as a teacher is to make them better musicians than I was when I was their age. If I can do that, then hopefully when they’re my age, they’re going to be better musicians than I am now. That’s my philosophy. I’m hoping it works. BD: You just hit the big 4-0. Are you at the point in your career now that you expected to be at this age? JS: [Laughs] When you’re in your thirties and you write something, people go, “Man did he write that? How old is he? He’s only 30-something?? ?” Then you get to be 40 and they say, “Is that all you’ve done?” That’s how I feel right now. I don’t know; I think it’s just a phase. I’ll get over it. BD: Thank you for all your music. I appreciate your coming in and chatting with me. This conversation was recorded in Chicago on May 28, 1994. Portions were broadcast on WNIB three days later. This transcription was made in 2014, and posted on this website at that time.